A couple of weeks back, we took a quick look at Fight Night Round 4 on Xbox 360 and established the game's 60FPS gameplay credentials, along with a pledge to take a look at the PS3 version in due course. Well, the demo code is up on PSN, and DF associate MazingerDUDE has had time to check it out. The good news is that it's essentially a match for the Xbox 360 version in every way that matters. As we suspected, the 4x multi-sampling anti-aliasing of the 360 code has been omitted in favour of the blur-inducing quincunx edge-smoothing technique that we see on a great many PS3 titles (including FNR4's pseudo-predecessor, Facebreaker). It works on some games, and looks pretty poor on others, but in the case of Fight Night Round 4, there doesn't appear to be any huge impact on the overall presentation, it still looks fantastic. Here's a quick look at in-game and cinematic performance via our frame analyser. As you can see, where it counts, the game performs as well as we would expect, with the crucial gameplay sections running at the same smooth 60FPS refresh update as the Xbox 360 version. Performance compromises are apparent in the cinematics however - rock solid at 30FPS on the Microsoft platform, but fluctuating somewhat on the PS3 game. Overall though, where it counts, the game's got it. 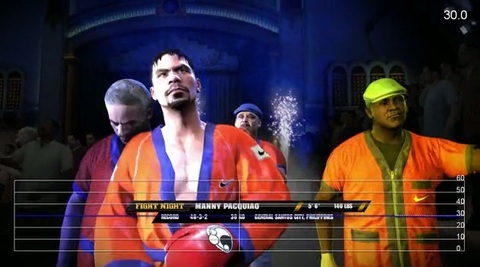 We're still awaiting final retail code, so Fight Night Round 4 is unlikely to make the cut for Face-Off 20, which is scheduled to hit Eurogamer later this week, but if it turns out that either the PS3 or 360 code falls short of the standards set in the demo, we'll be sure to let you know.